Best thing that ever happened to my lashes! A true dupe for one of Lancome’s mascaras. Mother nature didn’t bless me with fluffy eyelashes, so I have to look for a suitable mascara and, as it turned out, not every mascara is the right one. But this pink miracle is a lucky exception. First of all, I never liked ordinary wands before and bought only silicone ones, because otherwise the result would be unsatisfying. I like when this mascara starts to dry, because in this case you don’t have to wait for 10 minutes for your lashes to dry. I think those with short lashes without curl know what I’m talking about. Anyway. this mascara lives up to all my expectations except for the brush but I can forgive that for its quality! Also, this mascara is a dupe for the Lancome Monsieur Big Mascara. I realized that when I bought the mascara from Lancome. I had such a dejavu feeling. Their wands and formulas are identical, just let me show them on my eyes. It’s a great product and my must have forever. How is it possible not to assess this babe with 5 stars? 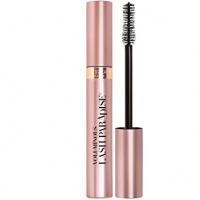 Such a simple though wonderful mascara!